This year's Economic Leadership Forum offers the opportunity to attend a policy tour that will include a visit to NorthLight Innovation. NorthLight Innovation is a new, 24,000 sq. ft. facility, operated by Yukonstruct Society that provides a centralized location and brings together business and industry, government and higher education in support of Yukon’s entrepreneurs. This integrated facility supports innovation and entrepreneurship through the provision of workspace, tools and equipment, high-speed internet, business assistance, networking and mentorship opportunities. These underpinnings foster a culture of entrepreneurship that will result in the successful incubation, commercialization, and export of Yukon-made innovative products. Air North is Yukon’s Airline, founded in 1977, to offer charter flights to the mining industry and flight training services, before growing into the commercial service fleet that operates today. The airline is deeply connected and integral to the Yukon’s economy- Air North is one of the largest employers in the Yukon Territory, with over 250 full and part-time employees, and one in fifteen Yukoners hold an equity or employment stake in the airline. The President and Co-founder, Joe Sparling is also one of the Boeing 737 captains! This tour will take you behind the scenes of the operations with a tour of the airport hangar and presentations from the airline leadership. Following the Air North tour, attendees will be taken to experience another key part of the Yukon economy- Yukon Brewing. Participants will be given a guided tour of the brewery operations and opportunity to sample some of the product. Yukon Brewing employees a large staff and supports countless Yukon events and causes each year- including the PNWER reception at Kwanlin Dun Centre. The brewery’s eight packaged beers are available across Alberta and BC, with some even finding their way as far as Quebec, and at the Hanover Zoo in Germany. 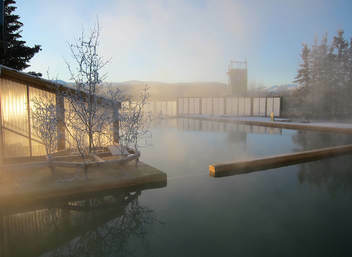 While in the Yukon, be sure to experience one of the most visited locations in the Yukon- the Takhini Hot Springs. The Takhini Hot springs have a long history in the Yukon, used by the First Nations people for centuries, the site was known for natural hot water flowing from the ground. In 1907, the site was commercially promoted for its therapeutic value. The hot springs natural and mineral rich water comes from intersecting faults in the earth. Rain water and snow from the mountains go deep into the earth, where the water is heated and the minerals dissolve. It is said to take 60 years for the water to come from the ground into the source. The spring pools are a relaxing 36 and 42 degrees Celsius ( 97 and 107 degrees Fahrenheit). The hot springs also participate in the International Hair Freezing contest- let the photos speak for themselves, and enjoy the opportunity to experience this firsthand! Attendees will be picked up from the hotel on Thursday, November 15 at 6:30pm, to relax in the Hot Springs. Entry and towel are provided. 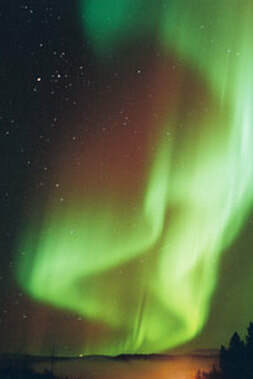 The group will return before 9pm, with plenty of time for those who wish to join the Northern Lights tour that evening. Don’t miss the opportunity to check seeing the Northern Lights off of your bucket list! Visiting the Yukon in the winter is the perfect opportunity to view the bright dancing lights of the Aurora, one of the most beautiful natural phenomena that one can experience. 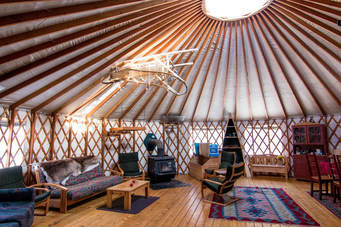 This guided tour will pick you up from the hotel at 9:30pm on Thursday, November 15 and take you to a rustic yurt located 20 minutes outside of town in open fields with no artificial lights around, providing the perfect viewing conditions. While at the site, you will be served hot drinks, a light snack, and the guide will share some of the folklore surrounding the Aurora with you. While it is cold and crisp outside, the cabin will keep you warm and cozy. By 2:00am, you will be back at your hotel still captured by the beauty of the Northern Lights. ​Only 30 spaces available, so be sure to sign up early! ​the Kwanlin Dün Cultural Centre with your fellow delegates and Yukon legislators. Voted Yukon's favorite museum, the MacBride Museum is the oldest museum in the Yukon and features exhibits on the Gold Rush, Yukon First Nations, and the Alaska-Canada Highway. The Kwanlin Dün Cultural Centre celebrates the culture, traditions, and history of the Yukon First Nations and seeks to share that knowledge with guests from the Yukon and beyond.